Double Draw Tarot Bags - Spellwork Double Draw Bag - Tarot Bags, Tarot Cards, Cloths, & More! 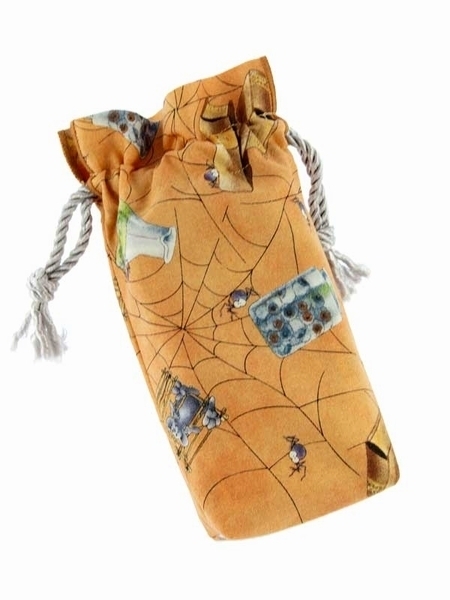 One of our personal favorites among all our tarot bags is this one. Against a light orange background you see cobwebs creep with spiders, a glass jar filled with eye balls stares back at you, and two thick books "Good Spells" and "Bad spells." Also shown are a caged mouse and a beaker full of swimming green slimy, wiggly things. As always, our Tarot bags aren't just for Tarot cards! They are also perfect for protecting your collectible cards, cards for trading card games, dice for D&D or other role-playing games, just about anything. Bag Design: Our Double Draw bags close with two drawstrings made of triple twist cord, which create a 1" ruffle effect when closed. The bottom of the bag is slightly squared off (gusseted) to better fit a deck of cards.